Well, I was in England, wasn't I? And what might you guess was one of the first things I simply had to do? Find a good British pub, eat and drink the foods I recalled from my two years living in that noble country some time ago. When you live for two years in the one place outside London, you have your favourite pub, and boy, did we visit ours often. Our pub had - in the correct manner of such things - dim lighting, lots of wood panelling, a long timber bar with the appropriate barperson behind it (bulldog look, curt manner - you have to love it). To us, it was best pub in all of the UK. Which is ridiculous to say because every local felt the same way about their own pub. You can't beat a British pub that you have claimed as yours. As well as the pint and a glass of cider (daring) we would often indulge in food. Oh, the lovely food in pubs back in those days - scotch eggs (don't you dare deride them). 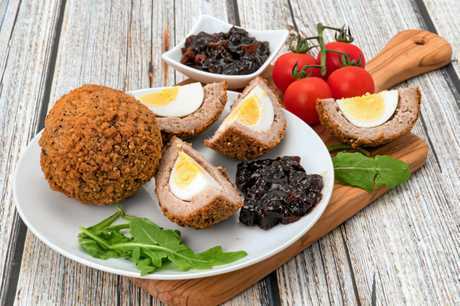 Hard-boiled eggs encased in sausage meat then breadcrumbed until they formed great big bawdy things, as large as ostrich eggs in some cases, deep fried to a lovely brownish, goldish colour and piled on to a large platter to head out from the kitchen to the pub counter. Who could resist? I can't recall any condiments that came with the eggs, but I do recall those that came with the marvel called a ploughman's lunch. Usually presented on a board, great English cheeses (Stilton, can't beat it) with chunks of bread and Branston Sweet Pickles, and if you were very fortunate a pot of white pickled onions. Other favourites which could never be beaten: roast beef and Yorkshire pudding, fish and chips, and flaky pastry pies with mushy peas. On our recent visit, as soon as we arrived in River Lea just outside London (a delightful cousin hosting us for a few days), we went out on our mission impossible. To find the perfect English pub with a bulldog face behind the bar. "There's a pub around the corner," our helpful cousin said. "But I haven't been to it. Victoria Beckham's parents live near it. Does that help?" It didn't but I wasn't about to say so. Instead we took a drive hoping to spot something we had held in our memories for four decades. Found one. Right on the River Lea with its boat hire operators, plenty of action on the water as people tried to get in and out of those funny-looking Pedalo boats. In we go looking for scotch eggs and a pint. No bulldog barman, just a handsome young man in his 30s telling us they don't do either any more, but they have a lovely pinot noir from New Zealand if we are interested. No. No. No. He then went on to tell us he was newly arrived in the UK, from Noosa. Our home town. Believe it? I was in as much disbelief as you. "We will go into the garden," and we went outside to sit at one of many benches floating in an ocean of cigarette butts. Sometimes your memories are best left to rest in peace. But not until after you have trawled all of the UK looking for better ones. And never give up and don't even give thought to Brexit. Of course, there are contemporary versions of the scotch egg. Ramsay, Jamie and Nigella have beautiful renditions, and you can buy them in posh shops such as Fortnum & Mason or have them sent to your home. You can even get them in roadside stops and supermarkets (the indignity of it). Some of the best named pubs in England, our opinion: The Long-Legged Mare (York), The Nobody Inn, (Devon) and our all-time favourite The Jolly Taxpayer (Portsmouth.) 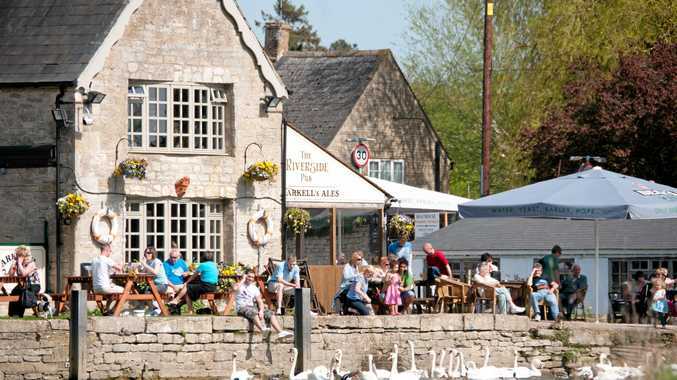 Lesser names but still goodies: The Swan, The Plough, The King's Arms, The Queen's Head.